We are all left with a single question hinted at by the matrix - WHY? On December 14, 2012, there was a horrific shooting at the Sandy Hook Elementary School in Newtown, Connecticut. The shooter was Adam Lanza. A crying President Obama addressed the nation about it. On the matrix below, the axis term is SANDY HOOK. In the open text is HE THAT IS TO DIE, as well as BLOOD OF YOUR BROTHER CRIES TO ME FROM THE GROUND. Part of the word GROUND is ADAM. At an ELS are LANZA, GUN, and OBAMA. Twenty children were murdered, and at the school 6 adults (plus the killer). Lanza also murdered his mother. A DAY LATER AND THE MISSING SONG. On the day after the shooting my wife and I took a walk on the beach here in Cape Canaveral as we do most days. We generally go out at about 5 PM, and walk north a bit to the jetty at Port Canaveral. As is usually the case, a Disney cruise ship, the Fantasy, was just emerging from the port as we reached the jetty. There are two Disney ships that sail from here on weekends, and each of them always plays the tune It's a small World After All on its ship's horns as it reaches the jetty and heads of out to sea. But not today. Fantasy slid past us in silence as it started its cruise on the 7th day of Chanukah, and we knew that the crew didn't want to call more attention to the small ones who had been slaughtered the day before - not a cruise with so many little ones likely aboard for the winter vacation. So the music was missing, even as the twenty 6 and 7 year old kids were, even from a school that had a security barrier in place to protect the kids and teachers. Sometimes it seems that too often, it's a sick world after all. FUTURE ISSUE - GUN CONTROL. Much of the initial reporting on this story turned out to be wrong. Reporting errors on December 14 included the name of the shooter (first reported as Ryan Lanza, the shooter's brother), the shooting of Adam Lanza's father, the idea that Lanza's mother was the teacher of kids killed at the school, and, of course, the initial number of kids reported dead at first (only one). After Obama's tearful words, he and other politicians indicated that gun control could be an issue, even though the shooter didn't use his own weapons, he stole them from his mother. On Saturday night I received an e-mail asking about troop movements in the U.S. and a possible civil war. I responded cautiously, pointing out that Obama's popularity was up in the polls since his re-election. But then I concluded by saying that our military is more loyal to the Constitution than the President, and that there was only one way that I could see a rebellion taking place - if the President was disloyal to the Constitution in an unambiguous fashion. The one example that I could of was if the President tried to confiscate all the guns in the country. I don't think Obama is that dumb, but only time will tell. STATISTICAL SIGNIFICANCE OF THE MATRIX. The matrix above was found in a hurry, just before the Sabbath began here at sundown. As per my usual protocol, no statistical significance was assigned to the axis term, SANDY HOOK. The phase in the open text HE THAT IS TO DIE is only found once in the Torah, and evidently the killer had decided that he was going to die. But the odds against it or an alternate phrase, He will surely die, would be on the matrix was about 19 to 1 on the 578-letter matrix. Because President Obama spoke to the nation with tears in his eyes soon after the shooting, I looked for his name. It was there, but not at a special case skip (+/-1 or the skip of the axis term). Obama usually has little statistical value unless the name is at a special case skip. He had about 1 chance in 4.7 to be on the matrix. ADAM was on the matrix at skip +1 against odds of about 2.7 to 1, and an ELS of LANZA was there against odds of about 3.3 to 1. 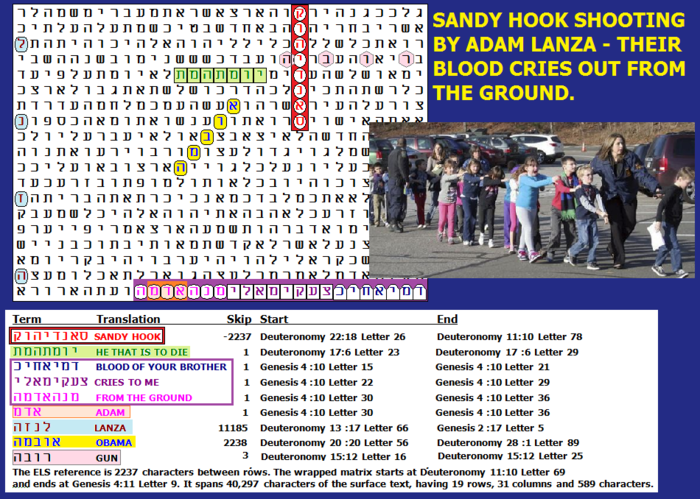 GUN was expected to be on the matrix, although it only took 88 letters to show it with SANDY HOOK, something that occurred against odds of about 1 chance in 12. The combined odds against these a-priori terms were about 801 to 1. What struck me was the presence of an a-posteriori phrase from Genesis 4:10. It reads, And He said, "What have you done? The voice of the BLOOD OF YOUR BROTHER CRIES TO ME FROM THE GROUND! " I don't usually include odds for such an a-posteriori find. In my rush to prepare for the Sabbath, I neglected to think of the obvious question that the nation would be asking over and over again in the aftermath of this crime. But had I thought of it, the odds against finding it would have been about 518 to 1.